Erin and her Fullbright friends use the phrase "loss of perspective" to cover the range of behavioral changes one experiences in a country where we are millionaires, being "the American" in town makes you a celebrity, the rest of the world seems far away, and vacation fashion is the norm. I experienced a bit of this in Ubud, and it is going to make the rest of the world a little difficult. guess how much it cost per night. Seriously. Tell me your guess and I'll tell you the answer later. And now I must tell you about our Ketut. He works at the hotel and is the most enthusiastic and helpful person in the world. He brought us our breakfast, he procured our tickets for cultural events and he even took us to holy sites all around Ubud by ojek (motorbike) for a mere $10 each. Whenever we were on our porch Ketut was there seeing if we needed anything. Ketut spoke pretty good English and he wanted to practice as much as possible with us. I seriously considered inviting him to work at camp. So we had better than expected accommodation and a very helpful concierge / tour guide / chauffeur / new friend. We started out logically enough. I have read that a backpacker can easily get by on $15 a day in Indonesia. Well I totally believe that but I spent about three times that on average. Of course we ate good but not top end food, we saw two traditional Balinese performances, visited several temples and holy sites, went to the sacred monkey forest and we did a fair bit of shopping. Oh the shopping. I am nowhere near to being a shopaholic normally. I have low shopping stamina. I like to research before I buy. But when you take someone who has been trying to save money for months and plop them down in a land where the US dollar is worth 10,000 rupiah something dangerous happens. Even worse if this person is a person who loves fabric and the country is know for beautiful textiles. Basically, I lost perspective. I had a few things I definitely wanted, and there were some gifts I was going to get. But then I realized how cheap the sarongs were. I fell in love with the batik (hand painted cloth) and ikat (intricately woven often hand dyed cloth). I had gotten out as much as I wanted to spend when we arrived in Ubud but by Saturday morning I was selling my leftover Australian currency to support my textile habit. Later that day I sold some USD. Erin was not as bad as me but we both went a little overboard. We realized, as I contemplated fitting the full bed sized ikat into my backpack, that we were out of control. But when the woman offered to sell us each a full sized totally awesome frog motif ikat for $7 each what were we supposed to do?! Overall I didn't really go over budget and my stuff all fit into my bag. And if I get married someday my ikat will ensure that I have plenty of children (frogs are a sign of fertility Erin tells me). Loss of perspective aside we had a really great trip. It is kind of funny that Erin and I had our first grown up vacation together like our aunts Lauri and Leslie do. This morning we bid Ketut a reluctant farewell, and later we had a very characteristically Maryland Shitama goodbye. Now I am in Bangkok again on my way to London. I am going from being a cool American with awesome buying power to being a stupid American who can't afford anything. I need to talk a little about Indonesian bathrooms. Most bathrooms here have a little hose with a squirt nozzle right next to the toilet so you can hose yourself and everything else down when you are done. What not all bathrooms have is toilet paper. Sometimes it is available out by the sinks, sometimes it is in the stall, and sometimes it is not there at all. This is where the hose comes in. This is also why the right hand is for eating, greeting, etc and the left is for doing other things. There is also plenty of water and usually soap for washing hands. The system seems to work pretty well. Now about the toilets. Most of the toilets I used were western style, but I did encounter a few squat toilets. Of course I am quite comfortable going to the bathroom in the wild, but when faced with the task of squatting over a hole on slippery tile and actually being expected to aim I was a little intimidated. Of course it wasn't a big deal, and the aiming thing is probably half the reason they provide the hoses. It is the little cultural adventures that make travel fun. The best part of the Indonesian bathroom is the mandi. I'm not sure if I'm spelling that right. Anyway, a mandi is a little bathtub sort of thing that you fill up with water. But you NEVER get IN the mandi. You scoop water out of it and pour it over yourself. There is always a drain in the bathroom floor, so you just stand there and dump water on the floor. It is very satisfying for anyone who ever wanted to splash water all over the bathroom as a little kid. Most places don't have hot water. That's ok though because it is so hot that the cold water is quite refreshing. The hotel where stayed in Ubud had a waterfall/fish pond thing right outside our room. The sound of flowing water was so loud that the first night I had a dream that I was relaxing in an overflowing mandi with flowers floating around me. It was delightful. Then I woke up and realized I needed to go to the bathroom. *I don't have service right now so these posts will be sent to my blog whenever I can send messages. My first morning there, I awoke when I heard the first call to prayer at 4 am. Well, that may be overstating it. I gradually became aware of the melody that was being sung over the loud speaker. A few seconds more and I realized what it was : the signal for students and teachers to come to the Mosque and pray. Almost all of the residents at the pesantren are Muslim and so 5 times a day they change into a different sarong and a special white jilbab (head covering) and flock to the Mosque. We did not go of course and so I immediately fell back to sleep. I woke up later and we laid around for awhile watching Al Jazeera, which is basically this part of the world's CNN. After awhile we went to find the laundry lady and went to eat lunch. The school cook gave us a whole bunch of food, which we piled into a bowl of rice and ate with spoons. Indonesians usually eat with spoons or their hands. I have noticed they don't really use napkins but wash their hands right after eating. By the way I love Indonesian food! That afternoon we walked around the town and out into the rice padis. The countryside around Coper is absolutely beautiful... My camera was utterly useless in trying to capture it. When we were walking back, the call to prayer was echoing out into the towns and fields. Because there are two pesantrens and at least one other Mosque around, sometimes multiple calls overlap, all following the same melody and words in a sort of round. Hearing the call makes me want to go too and sing and pray along. That evening I sat on the steps across from the Mosque and watched as the mass of girls flowed through campus and inside. Muslim prayer is nearly always led by men, but because this is an all-girls school the girls do the call and a female teacher acts as Imam. It is an amazing thing to watch teenage girls, covered from head to toe, singing out and reciting the call to prayer over the sound system. The prayer that follows is very physical. This is one of the reasons modesty is required in the Mosque. The people go through different postures to express different things to Allah. The postures include standing, kneeling, and prostrating on the floor. Each person brings their own prayer mat and the whole congregation goes through these motions many times, reciting prayers at certain points. When I asked, the girls told me it made them feel peaceful and unstressed to go to prayer. These girls are really cool. That night some of the little ones came to visit Erin's room. They took off their jilbabs and watched Beauty and the Beast with us. They also Loved Belay! One girl wrapped him up in my pashmina and jilbabed him and fed him shampoo. Adorable! The next day I went with Erin to her classes. She teaches English to 15 and 16 year olds. In each class I had to introduce myself and answer questions. Then, Erin read aloud two letters that my youth groupers wrote in response to letters written by Erin's classes. The girls were very excited to hear back from American kids. Both of our groups are getting an amazing lesson about humanity - we are basically all the same at heart. At the same time we don't all fit the stereotypes for our religions and culture. In one class I asked students how they felt about wearing the jilbab. They told me it made them feel beautiful and modest, and that it made men treat them with respect. I only wore the Princess-Jasmine-in-the-market version of the jilbab, like Erin does, but I can see the downside. It is really hot. It gets on your nerves sometimes. You take it off in private and have to remember to put it back on. Then again, I like the idea of having a tangible way to remind yourself and others that you are a precious child of God and a believer. All of these practices are appealing to me in some ways because faith needs to be interactive and engage the senses and feelings. Of course they can easily become empty obligations, but when the person can choose to participate (or choose to come willingly to the obligation) they have the power to bring us into deeper relationship with God. What I didn’t tell you in Thailand was that I had been trying to get in touch with Erin for a few days to see when she would get in to Bali, and hadn’t heard from her. So when I landed in Thailand I had a voicemail from her asking me to call. I called and found out that her flight back from Flores had been cancelled and she was doing her best to get back but I might have to be alone in Bali on Sunday. That didn’t seem like that big of a deal because Bali is touristy and full of hotels and taxis. I am a brave independent traveler, remember? So I didn’t stress too much about it. I managed to finally get about 2 hours of sleep on the floor near the check-in area for Air Asia. I was so tired by that point that I slept soundly until the desk opened at 4 am. I checked in, went to the bathroom sans giant backpack, flew through security and got onto the plane with very little hassle. I called just before we took off, and Erin said that she was on standby but she would leave me a voicemail telling me where I should go and what the plan was. I went to a wartel (a place where you can pay to use the phone), and the girl was very helpful in suggesting how I could dial on my phone but nothing worked. She said I could use the phone for 8,000 Rupiah a minute. I didn’t think this was much, but given my 2 hours of sleep the night before and my mild panic I was in no state to do math. I took a quick walk around looking for other options, and finally came back to the wartel and agreed to use the phone there. I was pretty sure 8,000 Rupiah was less than a dollar, so that was fine. I called Erin and she picked up! She asked where I was and I said I was in Bali. She said, “I’m in Bali too! Where ARE you? I’ve been looking for you for an hour!” Oh thank God. I told her I was in a wartel near the taxis and then proceeded to ramble. I was so relieved I almost forgot to pay for my phone call, and dragged my stuff out to a bench. Within 5 minutes Erin and her friend Andrea had found me. They also assured me that I had taken out around $100 from the ATM. Stupid zeros and decimals always get me. Anyway, we took a taxi to Kuta where we checked in a hotel and spend the rest of the afternoon at Kuta Beach, relaxing and catching up. We had sushi for dinner, walked around looking at shops (I bought some amazing Indonesian pants that are my new favorite thing), and finished the night off with a drink on the beach. Then I slept in a bed! In the morning Andrea left really early to fly back to her school. Erin and I had breakfast at the hotel, got amazing massages, and then flew to Surabaya. From Surabaya we took a bus to Ponorago, and then a taxi to the school, where we were going to collapse into bed. Instead, when we got there we found out that there was a bonfire happening! So we went to that and then collapsed into bed around 10 pm. The Bangkok airport is really nice. I feel totally safe being here overnight because it is well-lit and busy. Unfortunately these are also the reasons I can't sleep. I found a spot at the end of the third floor that was away from the shops and by a less used bathroom. This was clearly the place for people trying to sleep and several people were already stretched out on benches and the floor. I grabbed a bench (the metal benches made of individual seats that you find at airports) and settled down with my book (after a meal of pork noodles and dumplings for 205 bahts). I read for a long time, eventually stretching out. Finally I tried to sleep but just could not fall asleep. Maybe its the lights and people. I tried listening to an audio book and covering my eyes but no good. The bench, surprisingly, was more friendly on my back than the row of seats I slept across on my flight to Sydney. I should have passed out either way considering that I woke up at 5:30 am Sydney time and it is now 4 am there. And I only slept 4 hours last night and about 20 minutes on the plane. Finally, I gave in. I gathered my stuff together and went back to Starbucks where I ordered coffee and grabbed a cushy booth seat. I wrapped my pashmina around myself and reflected that I am world traveler Megan Shitama, who traipses around Asia and stays up all night at Starbucks. 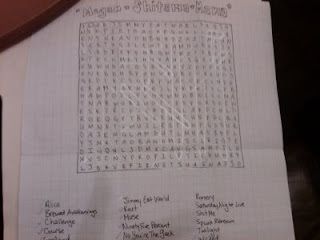 Then, depending on your perspective, I either raised or lowered my cool factor by pulling out my silver Sharpie gel pen and finishing the personalized word search that Gibb made for me. Incidentally, if you love word searches (or search-words as one of my special needs campers called them) I have a hint for making them extra challenging. Stay up for 23 hours or so and drink caffeine and sit under fluorescent lights until your eyes can barely focus on anything. It really ups the difficulty level! Well the wedding was just about perfect. The weather was amazing. The wedding was on the side of a mountain. Jackie looked perfect and the bridesmaids were pretty awesome too. Jackie and Pat were so happy. I was torn between tears and smiling my face off but I mostly grinned and bounced a little. I may provide a fuller analysis if I'm inspired later. It was great to meet Jackie's friends and family and hang out with the Donnellys. I also got to see Sarah Thorne (McPherson) and meet her new husband Jon. The three of us danced a good deal even when there were only 2 or 3 other dancers (or 0). But when there is a open bar and a decent DJ I feel it is just good sense to take advantage (responsibly of course!). It is sad to leave not knowing when i'll see my Aussie (and US-Aussie) friends again but I know I'll see them. But now for Thailand. I had the best airline meal of my life and that includes when I got my dad's upgrade to 1st class on Continental. I had stir fried Thai noodles with prawns and tofu, fruit salad and Australian cookies (anzu biscuits or something like that). I also watched the Duchess on my personal tv screen and since I fell asleep I was able to start it over and fast forward to where I dozed off! And I drank wine out of an adorable little glass the size of a shot glass. A flight attendant walked around and just kept filling it back up. Anyway now I'm at the Bangkok airport (no signs of rioting) and it is around 7 pm. I can't check in for my flight to Bali until 3 or 4 am though so I am hanging out until then. The kink in my plan is my backpack. I managed to make it under the 20 kg limit even though I forgot to weigh it (18.8 kg - perfect!) but now I have to lug this 19 kilos around because I couldn't precheck it and I can't find storage (or staff members who understand the question). This makes moving around (not to mention going to the bathroom) difficult since I can't leave it unattended. I did laps on 3 floors trying to figure out what to do with it and finally decided that I was stuck with it. I was also thirsty. So I ducked into a food stand and discovered that they sold alcohol there. At this point a cold lemon flavored Baccardi drink seemed like a really good plan but they only took cash. Stupid. What kind of airport vendor only takes cash??? So I schlepped back over to the ATM where I only had the vaguest idea of what the exchange rate was (based on the price of my ticket to Bali). In any case the second lowest withdrawal amount is usually safe, so I got out 1000 Thai bahts. I figured out that this in the neighborhood of $25USD but imagine how anxious one feels in taking out 1000 of anything without quite being sure of the exchange rate. I was right next to a Starbucks so I caved in to what is familiar and got a venti iced tea lemonade for 140 bahts. I think my next step is to decide whether to have noodles or meat pie for dinner and then settle in with The Devil Wears Prada, which Jackie gave me when she was packing up her room. Easter in Australia is an interesting thing. Most people get off work Thursday-Monday, so there's a lot of holiday weekend stuff happening, like the Easter Show, which as far as I can tell is something like a county fair but with Easter Bunnies and lots of chocolate. I got in Thursday of Easter Weekend. I had breakfast at 4 am AU time and was through security by about 7:30 am. Just past the gate I was greeted by Jackie, and moments later met with several blurry-eyed members of the Donnelly family. After a few minutes I headed off with Jackie and Pat. Before lunch we had stopped for pastries, Jackie and Pat signed their lease, and we stopped at Jackie's house where I unloaded my stuff and we picked up Pat's parents. We went to a pie shop for lunch, where I ate a steak and mushroom pie! I have been dreaming of pies since I left South Africa in 2006. After that we headed up to Illawarra Fly, a tree-top walk near Jackie's house. It was awesome and scary. On Friday we went up to meet the rest of Pat's family. From there we went to have fish and chips on the beach, and then we went to Symbio, a zoo. They had some interactive time where I got to PET A KOALA and hold a snake. The koalas are so cute, and the snake felt weird... all muscly. My favorite, though, was the common marmoset. Those were so cute. I wanted to smuggle one out in my pocket. I also went to the petting zoo type area where we could feed the animals, and fed kangaroos. That was really cool too. Saturday, we had a girls' day in Sydney. Jackie and her sister Michelle took me in to the city to see some of the touristy things. We went first to Chinatown for lunch, and had awesome Thai food at a food court where there were so many Asian food options I was momentarily paralyzed. After that we went to Darling Harbour, which is sort of like the Baltimore Inner Harbor, but Australian. It was the 21st birthday of Darling Harbour, so there was a bunch of cool carnival stuff going on. We went into a circus tent and saw an act with juggling and accordion/violin accompaniment. We also walked across the Pyrmouth Bridge and saw the middle swivel open to let a non-existent boat go by. After that we took a Matilda Ferry to Circular Quay, where we saw the Harbor Bridge and Sydney Opera House. After that we were tired, so we went to a shop where I bought a bunch of Australia gifts for people, and then we went to a surf shop where I bought awesome Australia Haviannas that have a small Australia on each one, and AU beaches printed on the soles. From there we went to a Rugby League game, which was an interesting experience. Today we went to Jackie's church and hung out at the house while Jackie packed her room. It was interesting because their church doesn't celebrate Easter. The service was nice; they meet in a community center and sang lots of hymns. It was weird though because the sermon would have fit in very well with Lent, but since it came on Easter sort of felt like having an extra day of class at the end of the semester. I found myself thinking "everyone is in church right now at home" at times, and really missing all of the trumpets and lilies and "Christ is Risen - He is Risen Indeed!" In fact, when Pat walked into the living room this morning I said "Christ is Risen!" Hoping that he would say "He is Risen Indeed!" but he didn't know to say that. Fortunately, a few minutes ago Aunt Leslie commented "He is risen indeed" on my "Christ is Risen" facebook status. On the up side, I had my first hot cross bun, which is apparently an Easter thing. I just know it as the nursery song. I then wikipediaed hot cross buns out of curiosity. Very interesting. Anyway, Christ is Risen. And fortunately, Easter is a season of 50 days and Pastor Amy is diligent about celebrating that long. So it will still be Easter when I get home. A college-aged guy reading a special collector's edition Twilight (the one that comes in a pretty box. I talked to Pam and confessed my irrational fear that I hadn't arranged for Jackie to pick me up. Jackie called me about a half an hour later to confirm that she was picking me up. I ate amazing ramen at a Japanese restaurant and was able to accurately guess the meaning of the name. Tomokazu means good friend or something similar. They switched the departure gate for my Sydney flight three times while I waited - without making announcements. I am sitting beside a guy who has the shaggy/pretty look of a model for a surfing company. He slept from take-off until 12 hours into our 14 hour flight and has not used the bathroom. I suspect he is wearing a diaper. Across the aisle from me there is a grandfatherly Australian with all four middle seats to himself. About 8 hours into the flight he switched with me so I could lie down for awhile. He said I looked like I was about to die from needing sleep. Bless him. Anyway, it just hit me that I am on vacation. I have been thinking of this as a trip - with lots to accomplish, but now it occurs to me that I should attempt some measure of relaxation. I'll work on that. We are making our final descent. I'll post this when we land in Sydney! *Apparently Oz is an acceptable abbreviation for Australia. So, I leave tomorrow for my whirlwind world tour. I'm going around the world in 28 days. I head first to Sydney, for wedding festivities and a little sight-seeing. I promise to take pictures at Outback Steakhouse. I'll be celebrating Easter there (Sydney, not Outback specifically)... of all the times to be away from church, that's probably the saddest, but Christ is risen everywhere. After that I am going to do a lot of flying hither and thither to visit Erin in Indonesia. I fly from Sydney to Bangkok, spend the night there, and then fly to Denpasar, Bali in Indonesia. Erin is meeting me at there, and we are flying to Surabaya, Java so to visit her school. Then we are going back to Bali to stay there for a few days. From there I fly back to Bangkok and switch planes there and in Abu Dhabi on my way to London. In England I have a long list of things I want to see (probably too many to possibly fit into one week). And I meet Megan there for the Megan Squared Invasion! Then, its home to the US, and straight back to work because Pecometh's busy season will be upon us.